A serious conversation piece with the looks to match. 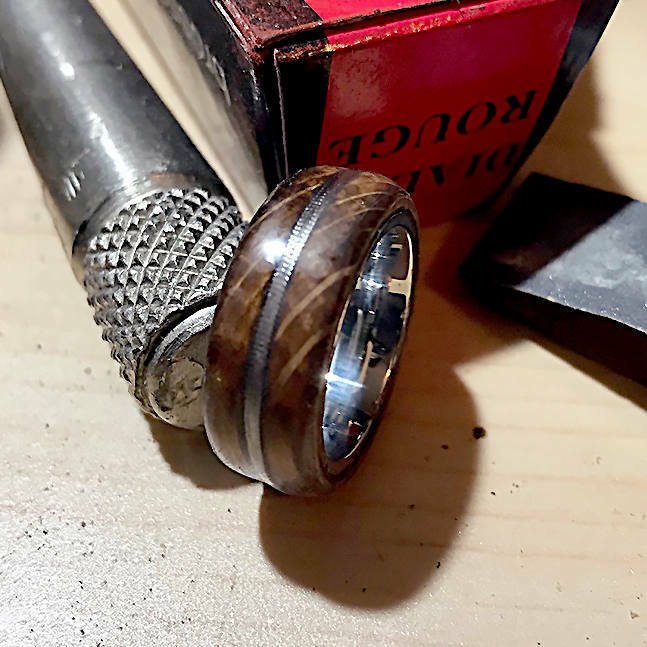 Is it the taste of Tennessee whiskey, the memories of that old six-string, or its scroll stopping good looks of our whiskey barrel ring that attracted you to this handmade piece of America. Whatever the reason both friends, family, and strangers will get caught up in the same awe every time someone remarks on its good looks and you start a conversation on the back story of this work of art. 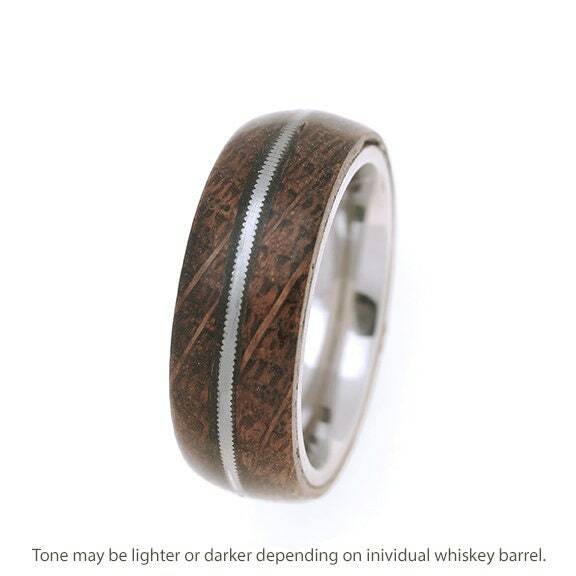 Each ring starts off as a stave harvested from an authentic used Jack Daniels whiskey barrel. The same way each piece of white oak is chosen specifically for each barrel, each stave is chosen specifically for each ring made. No two rings will be exactly the same, color, grain, marks and aging depend on what each barrel went through in the long process to give it that unique consistent flavor Jack Daniels is known for. We use a number 46 nickel wound electric guitar strings to create an inlay that screams rock and roll. These two iconic American pieces are then placed on beautiful stainless steel comfort band for strength, to make one of the finest conversation pieces to be worn on a hand. Next time you’re at the bar, tell the story and see where your night takes you. Each ring is made to order to your chosen ring size measured by a US ring sized jeweler’s mandrel. We highly recommend getting professionally sized by a jeweler before ordering. This is available in an 8mm width band with good weight and comfortable fit. Each band is custom made and has its own unique wood grain and charring. The photos are of recent rings, but no two are exactly the same. *** Jack Daniel's is a registered trademark and is not involved in or affiliated with the production or distribution of this product. 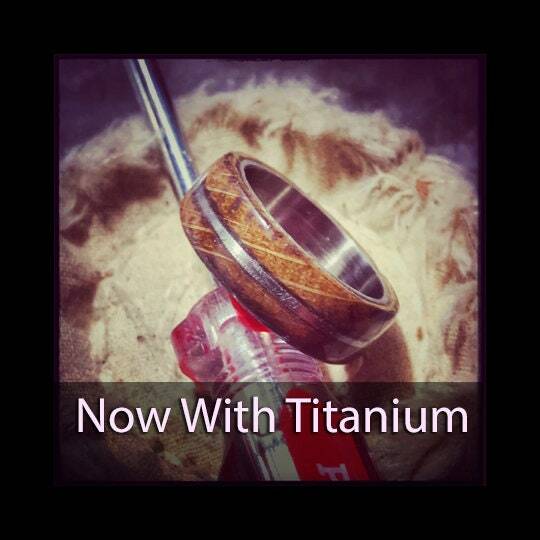 Each ring is custom milled from a solid piece of wood and made to your ring size using a jeweler's mandrill. The wood is then shaped and polished. The wood is then encased in a strong UV resin acrylate, making it water resistant and scratch resistant and ready for daily wear!